The Friends of Frank Furness Facebook page is lit with tributes to the Philadelphia architect who died 100 years ago today. Furness diehards made the trek to his grave last Sunday. The remains of the civil war veteran and architect were lost until a group seeking to pay tribute to Medal of Honor recipients got in touch with Laurel Hill Cemetery to find him fifteen years ago. A modest military headstone marks the final resting place, but far more impressive monuments, in the form of his masterworks, dot the streetscape of Center City, Philadelphia. But given the choice, what building by Furness would be his greatest monument? 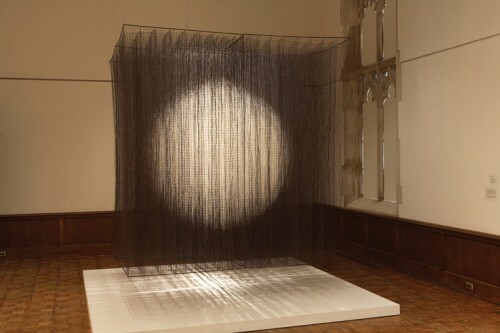 Is it the Pennsylvania Academy of Fine Arts? The Venturi-restored Fisher Fine Arts Library at Penn? 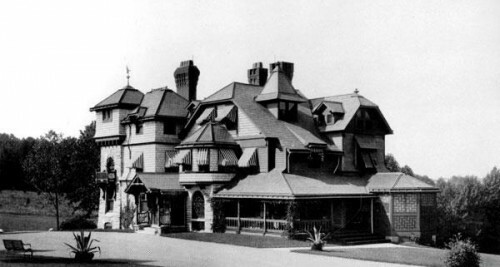 Or, perhaps one his multi gabled-grand homes, like Dolobran? Or would it be one of the dozens of small, but fanciful homes that animate downtown, or a modest church in South Philly? In one online video, Venturi pantomimes the prayerful bow he makes each time he passes the Academy. Amen. 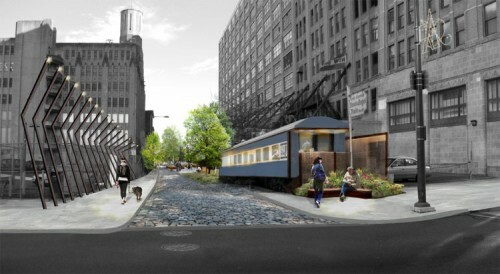 Philly is one step closer to creating an elevated park on an abandoned rail viaduct. Studio Bryan Hanes and Urban Engineers, two firms collaborating on the design of the SEPTA Spur phase of Philadelphia's Reading Viaduct, have released new images of the reclaimed railway that bring the proposal into focus. 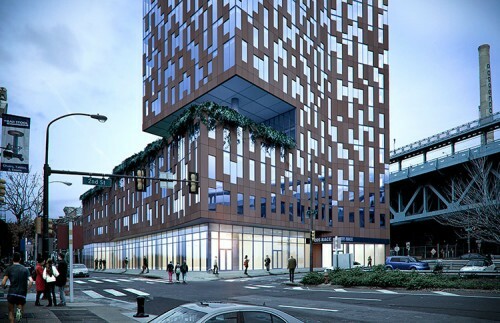 The Spur represents a significant step in realizing the vision of the elevated park with a primary entrance from Broad Street that rises from grade to the elevated rail line. The first phase stops just shy, however, of the wider, more programmable space on the main Viaduct. As a development teaser, the Spur will serve as a crucial component of fundraising efforts by park advocates, Viaduct Greene and the Reading Viaduct Project, and the design's reception could represent a make-or-break opportunity to complete the larger project. According to Bryan Hanes in an article from HiddenCity, "We have been working to maintain the industrial character of the space while finding the appropriate balance between program elements and the simple pleasure of being up off the ground in an awe-inspiring place." Funded primarily by the William Penn Foundation and the Poor Richards Charitable Trust, the Spur will make up just 9% of the total area of the proposed park. Although the dream of an elevated park so far remains a dream, construction of the SEPTA Spur would represent a huge accomplishment for the city of Philadelphia. As one local resident put it, "let's just do it!" Objects of Ruin. Israeli artist Ofra Lapid has taken society's obsession with ruin to a whole new level. 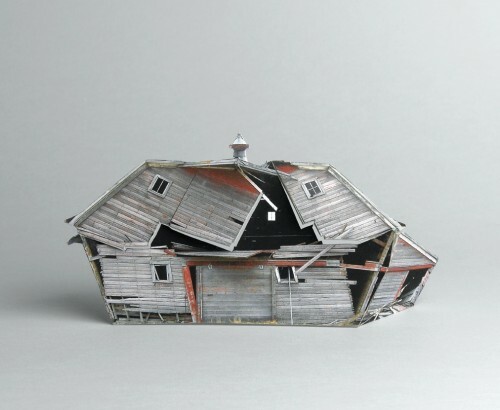 Inspired by amateur photographs from North Dakota's urban and rural decay, Lapid's Broken Houses series consists of small models of the dilapidated buildings that are re-photographed without their original context. Her work produces an eerie sense of reality set against a stark grey background. Check out more images after the jump. Tree Time. A place for every tree, and every tree in its place. Two maps from New York and Philadelphia are pinpointing the exact location of trees in each city. The Dirt reported that Edward S. Bernard and Ken Chaya have produced an illustrated map entitled Central Park Entire that seeks to honor the work of landscape architects Frederick Law Olmsted and Calvert Vaux by graphically representing all of the flora and fauna of Central Park. In Philadelphia, the PhillyTreeMap provides a similarly detailed online database that crowdsources each green public and private property. Making Connections. According to the Daily Joural of Commerce Oregon, the AIA will launch an online matchmaking service in September for stalled development projects and their potential real-estate investors in hopes of giving life to long-stalled projects while compiling data that helps identify problem developments. Parklet, PA. Philly is the latest city to jump off the bandwagon and set up a park, joining pavement-to-parks pioneers New York and San Francisco. 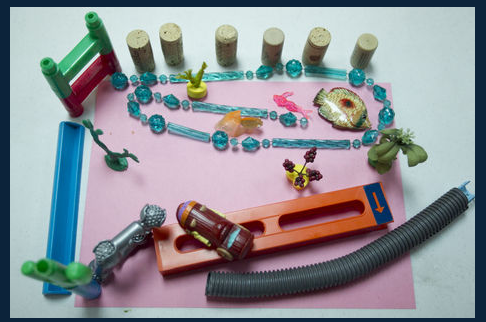 The city will convert parking spots into miniature parks as a low-cost way to open up green space in University City. Additional parklets could be introduced the upcoming years pending the success of their pilot project. 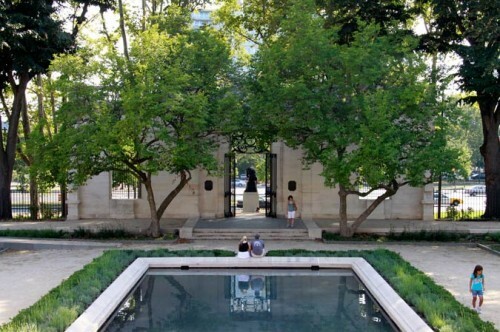 OLIN has completed a renovation of the gardens at Philadelphia's Rodin Museum, which houses the largest collection of Auguste Rodin's sculptures and objects outside of Paris. 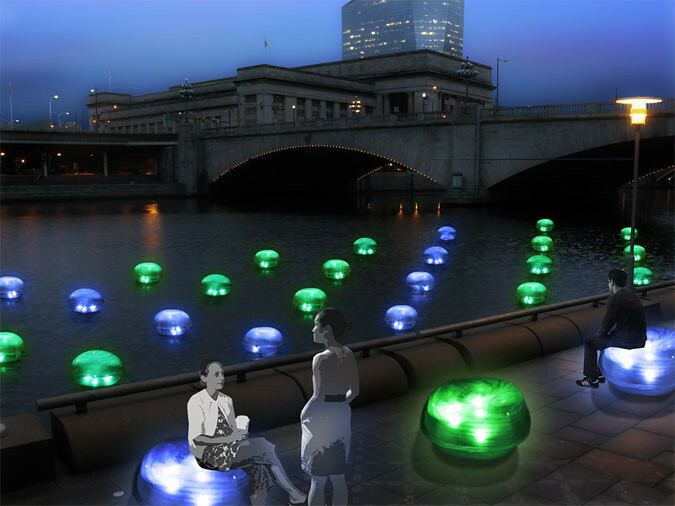 The renovation is a piece of a larger refurbishment of Benjamin Franklin Parkway, which is also being overseen by OLIN, as a part of the Philadelphia Museum of Art's Master Plan. The renovation restores the symmetry of the gardens, originally designed by architects Paul Cret and Jacques Gréber. The Robin space is a formal French garden within the more picturesque landscape of the Parkway. The landscape architects edited the plantings to increase the visual connection to the Parkway and added plants that would emphasize the "seasonality" of the garden, according to a statement from the firm. OLIN is also adding new outdoor furniture and lighting. Sculpture will be returned to the garden and the exterior of the building, including Eve and The Age of Bronze, which will be placed in niches on the facade. Adam and The Shade will also be placed in the garden, joining The Thinker, which currently sits at just beyond the gates at the Parkway entrance. 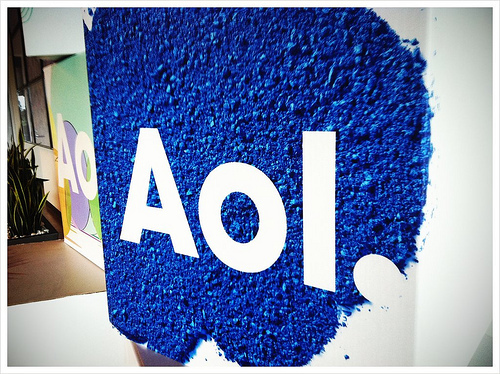 AOL's New Offices Are Snazzy: Fast Company has a slideshow of interior shots of AOL's new offices in Palo Alto. The space was designed to be bright and collaborative. "This being a tech company, naturally, it’s got a game room, too," writes Suzanne LaBarre. The interiors are the work of Studio O+A, which has designed offices for other Internet companies like Yelp, Facebook and PayPal. Philly Set For a Makeover: Sometimes it seems like Philly is the East Coast city people love to hate on for its small size, poor public transit and high crime rates. That may change soon with a new comprehensive plan for the city that could include: "more open space, bike lanes and preservation efforts, as well as specific goals including an extension of the Broad Street subway to the Navy Yard, an east Market Street that can really be Philly's 'Main Street', a waterfront lined with parks." NYC's Lesson for LA: New York Transportation Commissioner Janette Sadik-Khan blogs on how Los Angeles can learn from New York City's Plaza program. It's the quintessential showdown of cities: New York, a dense metropolis where most native-born teens don't even have their driver's licenses, and LA, a sprawling auto-centric city. There's even a book called "New York and Los Angeles" that says so. Sadik-Khan's piece is part of Streetsblog's new series on how the best transportation practices in other cities can be adapted for LA. Brownwashing Republicans: Grist has a list of 10 Republican politicians who are backtracking on pro-environment statements they've made in the past. The #1 offender is presidential candidate Newt Gingrich, who called for climate action in a 2008 ad for Al Gore's Alliance for Climate Protection. Earlier this year, he said, ""I would not adopt massively expensive plans over a theory." 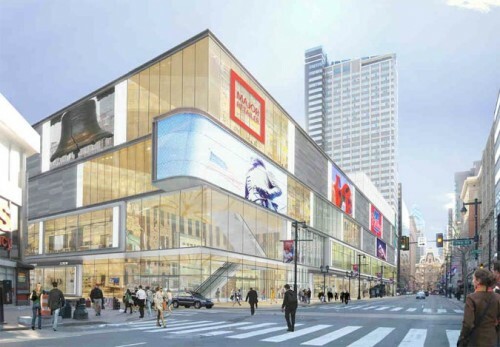 According to Paul Levy, executive director of the Center City District, revenue from advertising is needed to "stimulate development in that corridor." He said he disagreed that the proposed changes would make the area look like Times Square and that the bill permits large ads only on buildings whose owners have agreed to use the money to improve their properties, both the interior and exterior.